For the third time in as many years, head coach Charlie Sullivan and the Springfield College men’s volleyball team can call themselves Division III National Champions. With a 3-0 sweep of Juniata College on Sunday, April 27, led by 17 kills from sophomore outside hitter Luis Vega, the Pride have once again been able to cut down the black nylon strings of the National Championship net. Vega, who went on to be named the tournament’s Most Outstanding Player for the second time in a row, started off cold in the match, but eventually he caught fire, resulting in a string of instrumental kills that sparked the necessary momentum for the Pride to grind out the three-set victory over the Eagles in front of a hostile road crowd. “It was a pretty tight match with a lot of pivotal moments and I am very proud of our guys to step up, showing focus and determination and producing some great rallies,” said Sullivan following the match. To most viewers of the game, the Pride’s offense of Vega and reigning American Volleyball Coaches Association Player of the Year Jimmy O’Leary proved to be the most crucial stat of the game, but it was the Pride’s defense, holding one of the nation’s top outside hitters, Paul Kuhn, to just a .238 hitting percentage, that proved to be the difference. 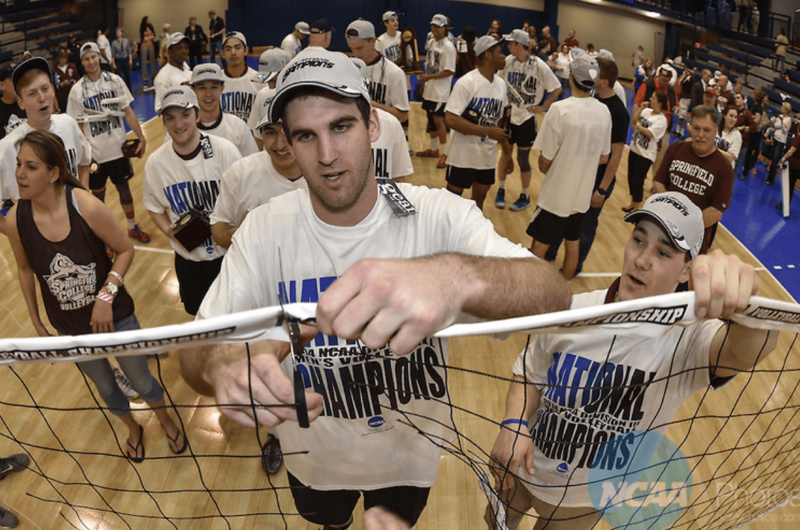 The past three years, the AVCA Player of the Year has been on a team that did not win the National Championship. In fact, the Player of the Year has always lost to Springfield in the national title match. In 2012, Randy Hansen of Carthage College was named the AVCA Player of the Year, and the Red Men were swept by Springfield. In 2013, Nazareth College setter E.J. Wells-Spicer garnered the national recognition, and the Golden Flyers were swept 3-0 by the Pride. However, in 2014, the curse was broken. O’Leary, who finished the match with 13 kills at a remarkable .750 clip, helped pace the Pride to victory. O’Leary, who took over for one of the most prolific middle blockers in Springfield College’s prestigious program, Greg Falcone, knew that this year was the year for him to rise to the occasion. 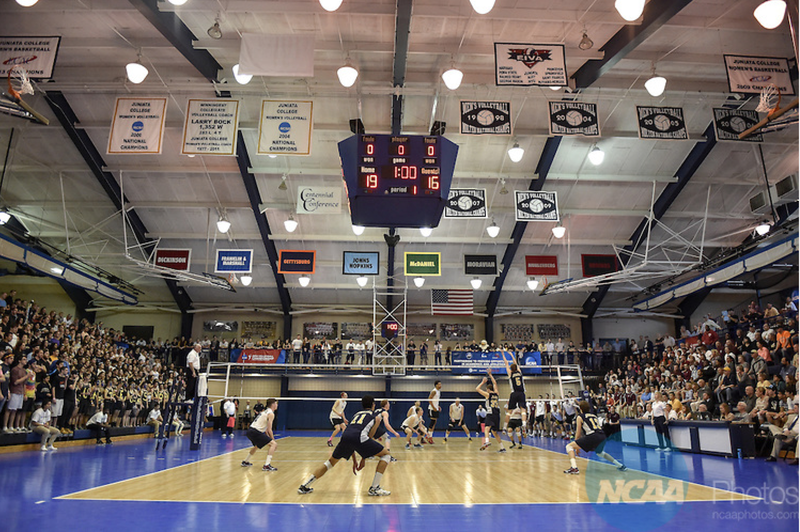 Vega, who posted 13 kills in the 2013 National Championship match against Nazareth, followed it up with 17 kills against Juniata in the title match. Despite all of his successes, the sophomore from Corozal, Puerto Rico believes it is the group known as the “Maroon Team,” Springfield’s scout team, that helps the Pride be prepared for every match. Over the course of 35 games in 2014, the Pride used 18 different line-up combinations. However, for the final four matches of the season and the three matches throughout the NCAA Tournament, their line-up consisting of Vega, O’Leary, Pieper, Sean Zuvich, Sean Peterson, Angel Perez and Nick Ferry proved to be the recipe for the Pride’s success. Midway through the season, there was little hope for the outsiders looking in that Springfield would be the nation’s top team come season’s end. After a 3-0 loss to Concordia University on Saturday, February 22, the Pride went on to win 16 Division III matches in a row. Men’s volleyball has become a staple at Springfield College. Charlie Sullivan has created a brand name behind coaching the sport. To go along with all of the success of the program, the team is appreciative of all the support they receive from the Springfield College Athletics Department, along with the students and faculty that pace Alden Street day in and day out.